Point Pleasant junior Nazar Abbas maintains leverage on an opponent during the Jason Eades Memorial Duals held on Dec. 8, 2018, at Point Pleasant High School in Point Pleasant, W.Va.
JOHNSON CITY, Tenn. — The Blue Ridge Mountains were painted black. 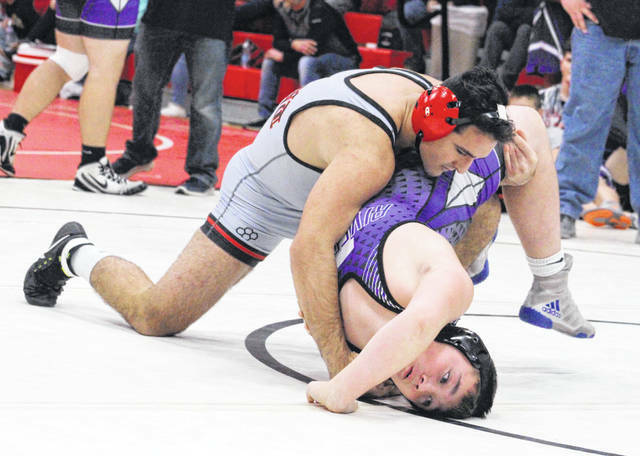 The Point Pleasant wrestling team came away with two individual champions and 13 top eight finishes while claiming the team championship on Saturday at the 2019 Fandetti-Richardson Brawl hosted by Science Hill High School in the Volunteer State. The Big Blacks defeated the entire 19-team field by 42½ points after posting 10 top four efforts en route to a winning team score of 261 points. McCallie ended up as the overall runner-up with 218.5 points, with host Science Hill (214) and Bradley Central (204.5) rounding out the three and four positions. Christopher Smith and Derek Raike both posted perfect 5-0 mark in their respective divisions while claiming weight class titles. Smith scored one pinfall win on his way to the 113-pound crown, while Raike — who was named the Most Outstanding Wrestler for the 106-145 divisions — landed three pinfalls en route to the 120-pound title. Isaac Short (106), Mitchell Freeman (138) and Nazar Abbas (170) each ended up second in their respective weight classes, with Short and Freeman both falling by a 3-2 counts in their divisional championship finals. Zac Samson (152), Logan Southall (160) and Jacob Muncy (285) were all third in their respective weight classes, while Juan Marquez (182) and Wyatt Stanley (220) scored a pair of fourth place finishes in their divisions. George Smith (132) and Wyatt Wilson (145) both placed fifth in their weight classes, while Nick Ball ended up seventh overall at 195 pounds. Chase Diehl of Science Hill won the 170-pound division and was named the Most Outstanding Wrestler in the 152-285 weight classes. McCallie came away with six of the 14 individual weight class championships, with PPHS and Bradley Central both scoring two divisional titles. Morristown West, Pigeon Forge, Hardin Valley and Science Hill also had an individual champion apiece. Point Pleasant returns to action Friday and Saturday when it partakes in the WSAZ Invitational at the Big Sandy Superstore Arena in Huntington.